Stage measures 6 feet tall by 8 feet wide 24" by 48" stage opening and accommodates up to 4 puppeteers. Curtain is designed for puppeteers to see the audience but is hard for the audience to see the puppeteers. Nice wide playboard to facilitate lots of props or to sit puppets. 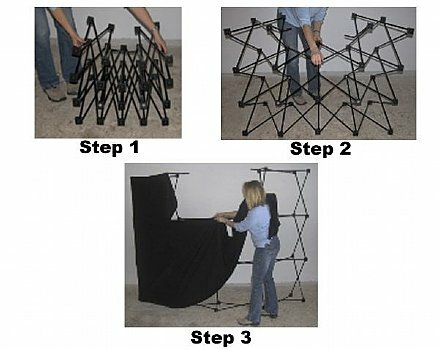 Easy to assemble and disassemble. 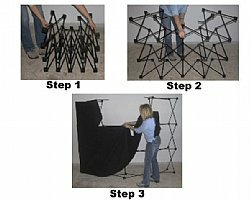 Entire stage folds up into one duffel bag for easy storage and moving. 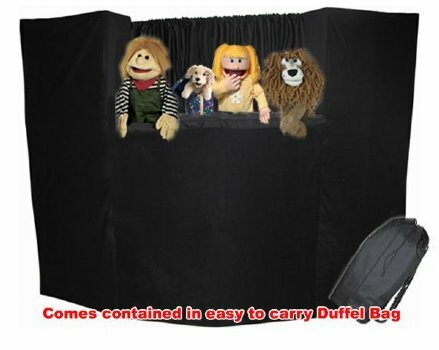 Duffel bag is designed as a backpack, leaving your hands free to carry your puppets to your performance. Entire stage weighs only 20 lbs. !